A Classic Design. The Perfect Companion. A Smart Solution. The Miso Pup Mesh Pet Carrier Bag is the result of years of research and months and months of designing and redesigning. Finding a pet carrier for my new puppy was a daunting task, Abigail was only 1.9 pounds when I brought her home. I knew she was going to be my constant sidekick and I planned on taking her with me when running errands, traveling and pretty much anywhere and everywhere I went. So, I knew I needed to start training her early, for our adventures, and I knew I needed to find the perfect, airline approved pet carrier. I needed a carrier that she would be comfortable in, that allowed her to poke out her nosy little face and that was discreet enough to use for those not so pet friendly places I need to go to. Finding a bag for her to jump into wasn’t the tough part, she loves handbags, as much as I do… finding a bag stylish and functional enough for me- that was tough part. Like many new dog owners and PupSize pet parents, shopping for this new lifestyle (and her) became an obsession. Trips to the mall were replaced with trips to Petsmart, Petco and any dog boutique within a 20 mile radius. Cute dog sweaters, adorable puppy pajamas, harness, leashes and yes, pet carriers, you name and Abigail had it. I actually created Abigail her own email account for all the online shopping we were doing, which didn’t help the FedEx guy, UPS dude and mailman, who were so sick of delivering packages, they started to just throw the packages at our front door. Not happy with any, of the many pet carriers, I bought, and with poor little Abigail, so confused about which bag to jump into when I told her “Let’s Go,” the only thing I could do was start to think, about the perfect pet carrying travel bag. Some pet carriers were great for her, perfectly sized as a FAA compliant carrier for airline travel, had a long enough zipper that allowed her to get in and out of the bag by herself and provided her enough visibility and privacy that she felt safe and cozy. I, on the other hand, felt that the many pet carriers I bought didn’t have enough pockets, were too heavy and were not really a good look or my style. Traveling with Abigail turned me into a bag lady. In the car, I had a bag for her essentials, like food, bottled water, treats,extra clothes, her blanket and a bunch of her toys. I also had plastic bags with travel bowls, potty pads, leashes and a brush and more plastic bags. There’s nothing worse then being out and having to buy something that you know have at home. When we traveled by plane, it was even worse, on top of the paperwork (boarding pass, health certificate and travel itinerary), her food and snacks, blanket, toys, chews, water bottle, potty pads and anything else I thought she may need, if we were delayed or had an unexpected layover. I also had my own belongings that I needed and I needed an entire travel bag, just for a sweater or a pashmina, a pair of socks, my beloved iPad, and my purse, that held my wallet and cell phone. Getting to the airport was a mess and going through security was a chore, I knew there just had to be a better way to travel with my dog. Pup Inspired. Superior Quality. Nonstop Comfort. I wanted to make the phrase “traveling with my dog” stress free, easy and less of a chore for me, Abigail and PupSize pet parents and pups, everywhere. I like to think that the Miso Pup Interchangeable Pet Carrier is “The Ultimate Bag for Toting and Traveling for you and your pup.” Actually, we have received so many great comments from real small dog owners, about how much they love all the Miso Pup bags and how its such a great idea and how they can’t believe that no one else has ever thought to do this. We also constantly being asked if we can make it in a bigger size and why don’t we sell our bags in their favorite pet friendly department stores, where they shop. 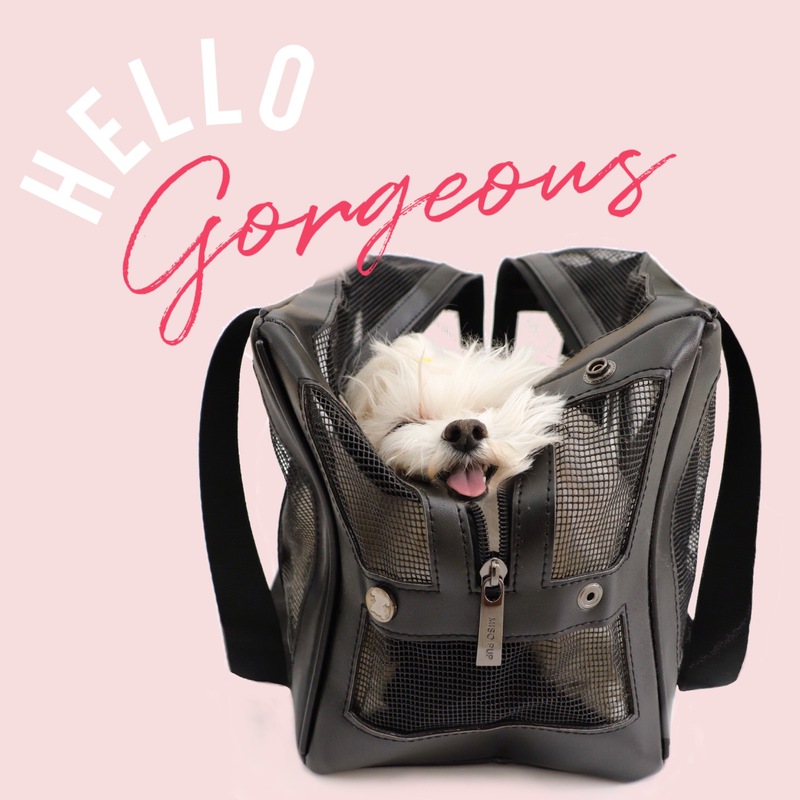 When designing the Mesh Carrier, I, honestly researched and examined every detail that would make this the best pet carrier for small dogs and those who take and tote them. The Mesh Carrier and the Shell Totes were tested, used and carried by a countless number of pups and their parents, on a daily basis and during their travels. After a few changes were made and many samples were created and recreated, I had the details of the design, just the way it needed to be to be perfect. Then the materials and quality of workmanship were pushed to a level beyond superior for the finished product, to a level that is good enough for Abigail to be in and great enough for me to carry. One of the many issues I found during my research and when asking small dog owners about traveling with their fur babies, was the fact that many of these tiny and very small breeds were exactly that, too tiny and small for many of the carriers on the market. And when it came time to travel in an airline approved pet carrier, many of these dogs were really scared, nervous and very weary of travel because they were uncomfortable in a new or unfamiliar carrier. These pups also associated their travel bag with all the stress that we feel and all the frenzy that comes along with a trip on an airplane. The Miso Pup Mesh Bag has durable mesh panels on all four sides and also on the top of the bag. It has a long, two way zipper that allows even the smallest PupSize pup to enter and exit by themselves. The height of the Mesh Bag measures 9 inches and the zipper drop on the sides measures 4 inches, leaving a 5 inch base- allowing a dog to not only be able to jump in and out when placed on the ground, but also allows their head to rest comfortably when unzipped. I specifically designed this bag to ensure our pups would be able to see us from all sides and provided them cross ventilation, for those hot summer days and stuffy airplanes. The shoulder straps drop 12.5 inches, which allows you to comfortably wear the bag on your shoulder and allows your pups to be carried at a level that is truly by your side. The included cushion is removable and can be wrapped in your baby’s favorite blanket or with the included washable dust bag. I did not want the cushion to be attached to the bottom of the bag with velcro or in any other way that may harm the pups, and you will also notice that there is no interior leash attachment. When I was designing this, I reached out to the very helpful, very knowledgeable Center for Pet Safety, as well as, other pet experts, veterinarians, animal behaviorist, dog trainers and pet carrier manufacturers and pet product companies, about whether or not the pet carrier should include an interior leash attachment. My thoughts are always safety first and felt that puppies, tiny dogs and small pups could get tangled or even worse, they may jump out while attached. I found out that there have been a number of accidents and deaths associated with pups being attached to the carrier and there also have been incidents and events when dogs were not attached- some dogs jumped out and ran away, when not supervised. I was also told that not many people actually use this feature on the bags and if a small breed puppy or PupSize dog is introduced to a carrier bag, they will, almost naturally, utilize and associate their carrier as their safe place. After carefully weighing the pros and cons of an interior leash attachment, it was decided to not include this feature. As an option, for those pet parents who want to attached their pup to a pet carrier, it was suggest to me, that a leash can always be tied to the shoulder straps, because the two-way zipper will allow the leash to into the carrier, thus allowing the interior of the Mesh Bag to remain free of any potential dangling dangers. This made total sense to me and is the reason there is no interior leash attachment inside the Miso Pup Mesh Pet Carrier Bag. Introducing The Miso Pup Mesh Bag for Tiny and Small Dogs. As I mentioned, it has taken about 2 years from thoughts, to idea, to prototypes, to testing to finally and proudly launching The Miso Pup Interchangeable Pet Carrier. The Mesh dog carrier was just the first step in taking the tradition pet carrier to a new level, our collection of Handbag Shell Totes completely revolutionized the way we can travel with and tote our lovable PupSize pups and it even adds some style, sophistication and fun to our already fabulous lives. Filing for a patent, getting the website up and goods manufactured are an entirely different story, that I won’t tell you about here, but will share in future post. I truly hope you and your pup enjoy our bags, as much as, Abigail and I do. It’s been a long process, an exciting journey that has filled my heart and mind with love and lessons. Meeting, talking to and hearing from all the happy and thankful pet parents coupled with knowing that we have helped ease their pup’s anxiety about traveling and added a fashion accessory that they both love… makes it a little easier when I have to explain to Abigail, the reason we need to do some work… before we can go shopping at the mall.